The country’s first national park, Yellowstone, is a nearly 3,500 square miles of natural beauty occupying the northwest corner of Wyoming and parts of Montana and Idaho. Located atop the Yellowstone Caldera—considered the largest supervolcano on the continent—it’s filled with hot springs and geysers that make it one of world’s most unique environments. In fact, two thirds of the world’s geysers are found within the confines of the park. Beyond that, Yellowstone is packed with scenic mountains, forests, lakes, alpine rivers, waterfalls, and some of the most spectacular wildlife you’re likely to see. A trip to Yellowstone means deciding how best explore the massive park, which at 2.2 million acres, is larger than the state of Rhode Island. Five different entry points will take you into the park, classified by their geographic location: west, north, northeast, east, and south. Each has a number of benefits, but by far the most popular entrance is from the west, where the town of West Yellowstone, Montana, serves as the entry point. This small, visitor-minded hamlet boasts a year-round population of only 1,353, but the town sees more than four million visitors annually. It has developed to accommodate these travelers with a wealth of hotels, guest ranches, restaurants, bars, and even museums. West Yellowstone manages to accommodate high seasonal traffic while still maintaining its Old West charm—including a rodeo throughout the summer months. While West Yellowstone alone provides a good reason for starting your journey at the west entrance, the park itself backs up that logic. 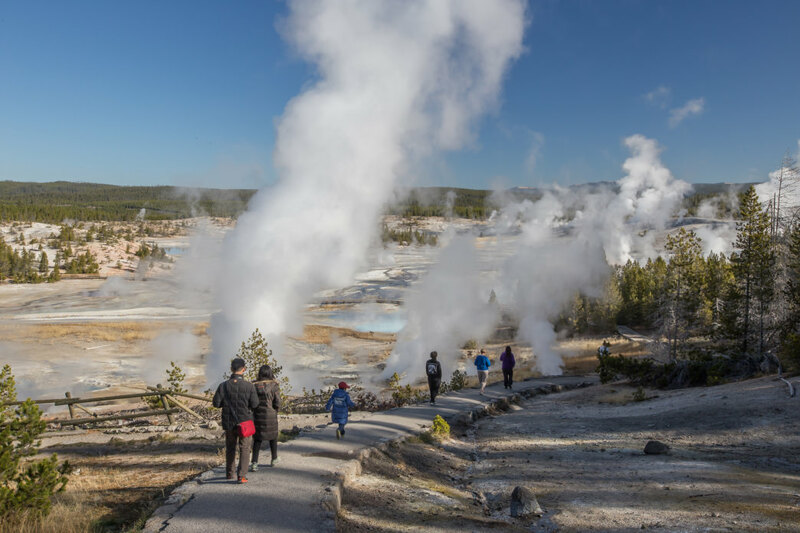 Entering Yellowstone from the west puts visitors in the very heart of Yellowstone’s geyser country, meaning it’s the quickest way to visit Old Faithful and a number of the park’s best-known attractions. Roads are very well-maintained in this section of the park, providing comfortable driving conditions. Entering the Park from the west puts visitors in the very heart of Yellowstone’s geyser country. 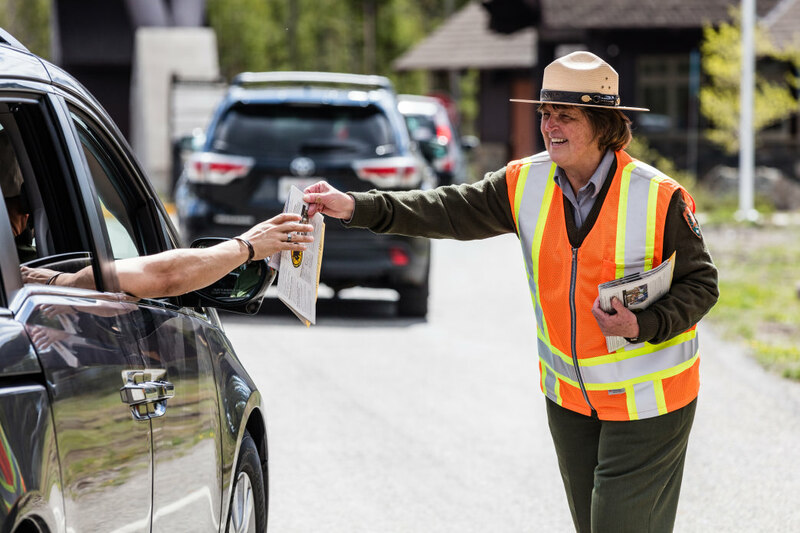 Visitors entering Yellowstone will receive a park map and small newsletter by National Park Service staff. Read up on the latest news—this often includes up-to-date road construction information that will be helpful in avoiding delays during the busy summer months. The easy-to-navigate map includes information on popular sights and destinations. From the west entrance, the road winds along for 14 miles, paralleling the scenic Madison River. Be sure to watch for bison and elk before you reach Madison Junction, a crossroads leading to geyser basins to the north and south. The Madison Junction campground is a popular stopping place for those wanting access to both West Yellowstone and the park itself, and a large, modern rest stop is a handy place to stretch your legs before traveling onward. Visit Lower Geyser Basin for some mind-boggling sights. Lower Geyser Basin, the largest geyser basin in Yellowstone. It includes mind-blowing sights of the Great Fountain Geyser, Firehole Lake Drive, and the famed Fountain Paint Pot. This mud pot, which is an acidic hot spring that takes the form of bubbling mud, produces amazing colors throughout the year, as the iron in the mud oxidizes. At different times of the year you’ll see vibrant blues, greens, reds, and yellows. Midway Geyser Basin, which is home to Grand Prismatic Spring. It’s the largest hot spring in the U.S. and the third largest in the world. The colors found in the massive spring mirror those found in an optical prism—dazzling red, orange, yellow, green, and blue—providing its tell-tale name. A well-built, expansive boardwalk with educational signs explains the mysteries of this incredible sight. The Upper Geyser Basin, where more than 150 geysers reside in one square mile. This is a geothermal activity hub and home to Old Faithful, Biscuit Basin, and many sights worth exploring. The Old Faithful Visitor Education Center offers interactive activities and presentations that will intrigue and educate travelers of all ages. 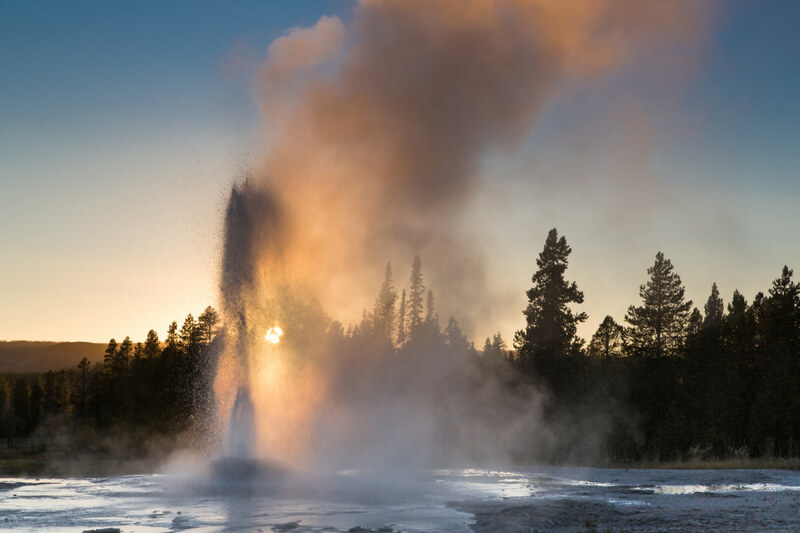 Norris Geyser Basin is home to the Steamboat Geyser, which shoots water more than 300 feet into the air. If at Madison Junction you head north, you’ll reach the park’s oldest, hottest, and most changeable thermal area, the Norris Geyser Basin. The basin is home to the world’s tallest active geyser, Steamboat Geyser, which shoots water more than 300 feet in the air. You’ll also find an array of colorful hot springs en route to the gorgeously tiered Mammoth Hot Springs and its expansive boardwalks. The terrain here becomes much much more stark and arid, resembling something out of science fiction movie. If you’d like to let someone else do the driving, the western entrance to the park is home to a variety of group-sightseeing tours, which provide motorcoaches to take visitors through the park, often focusing on wildlife, photography, or backcountry excursions. While the western entrance may be best known for its access to geyser country, that’s certainly not all that’s available for visitors to this section of the park. From West Yellowstone, you can access some of the best fly fishing in the country, with several blue-ribbon trout streams close to town. Nearby Hebgen Lake, just outside the park, is known as one of Montana’s best still water and dry fly fisheries. Marinas can provide boats and fishings supplies. Active travelers who enjoy hiking and biking will find lots to love in this region as well. Outfitters like Shurr Adventures and See Yellowstone can help you plan for a trip that focuses on exploring the park by foot or two wheels. Come winter, West Yellowstone becomes a snowmobile mecca. The park entrance is closed to cars, but you can still access Yellowstone by snowmobile or snowcoach through the six park-authorized concessionaires who provided guided tours. In West Yellowstone outside the park, you’ll find hundreds of miles of snowmobile trails to explore on your own. Any time of the year, West Yellowstone truly is an ideal place to base your Yellowstone adventure. With an abundance of lodging accommodations, RV parks, and campgrounds, it’s the easiest way to spend the night. You’ll find in-town entertainment such as the Grizzly & Wolf Discovery Center, an IMAX theatre, the Yellowstone Historic Center, plus live theatre, and much more. After a day of exploring Yellowstone, it’s a great place to kick back, relax, enjoy a good meal and start planning for the next day’s adventure.